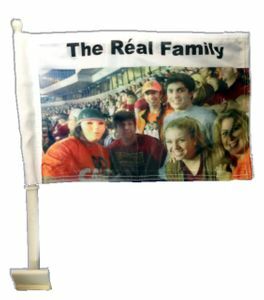 You can email us any image and we can put it on the flag for you. It can even be a photograph of a pet or of a piece of artwork you or a child drew. You can add any caption you would like. This is an example of what you can create. You can pick the color flag. You can even put your little league's team logo. The sky is the limit! You can have as many colors as you like for the same low price of $29.95. These flags are made to last. They are 11" x 15.5" and are double sided, double stitched around the edges and triple stitched on the corners. If you would like more information, give us a call at 1-866-982-3524 or email Lorraine at lorraine@flagsoncars.com.